“There is nothing I can change now, even if my parents accept the fact that it was their biggest mistake to leave our village and move to Delhi,” says Raj Kumar, a driver. 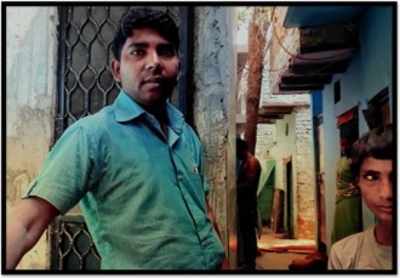 Kumar lives in a slum near Block 18, Kalyanpuri, in East Delhi. He is one of the many who add to the staggering 49 per cent population of Delhi living in unauthorised colonies and slums. He says it is now futile to keep blaming his parents for his and his family’s misfortune. “He was hardly four years old,” whispered an old woman when she saw Kumar struggle to recall the age when his parents brought him from Arariya, Bihar. “I have been to my home town thrice and I remember begging my parents not to return to Delhi,” he said. Kumar reminisced about his childhood and the days he spent in his village. He was repulsed seeing the sorry state of the slum he was brought to by his parents. His helplessness was clearly visible as Kumar stared at the narrow footpath and then at the open drain, almost as wide, which ran parallel. Raj Kumar(left) a resident of slum in Block 18 Kalyanpuri, New Delhi worrying about his son’s (right) future“I am helpless,” he sobbed. “I had always wished not to have kids till I am capable of providing them with clean and prosperous living conditions. But look at me now, I have two kids; a boy and a girl. The filth is just one of my worries, what fears me the most are the people ; their habits and influence. Due to our work, it is impossible for my wife and me to keep an eye on the kids always. I fear that my kids might be coaxed into doing something wrong. “If my kids end up on the wrong path, our purpose for earning will be defeated .” Kumar said, subtly pointing out to the cluster of teenagers sitting hardly hundred meters away, smoking weed and cigarettes. His agitation was evident. Even though volatile substance abuse is not limited to children and adolescents of any particular social group, “it is only fair to assume that street children, being one of the most vulnerable and marginalised groups, would be at a considerably higher risk,” states a 2016 research paper by Vidhi Centre For Legal Policy that studied drug abuse among street children in Delhi. “More than the unhygienic surroundings, the squalid mentality of such teenagers makes the slum a contemptible place to live in” said Sheela who sat nearby packing small toys. Most of the women in the slum earned money by packing small plastic toys brought from some factory in Ghazipur. Imagine a slum, what comes to mind? Probably an unclean, unhygienic and congested inhabitation of people belonging to the lower economic stratas of the society . Although, Kumar’s slum had a Gordian knot; the misguided teens, like most other slums, however, not everything at Kalyanpuri was as dreadful. The women in the slum were the first ones to take an initiative. They have tried to change all that they could. The municipality and other authorities might not be as involved as the women of the slum in attaining the goal of ’Swachh Bharat’ (Clean India). “It doesn’t matter if we cannot build toilets in our homes due to lack of space, we still have community toilets,” said Sheela Devi. She was more than happy to speak about the work she had done along with other ladies. “We worry so much about our kids and try to keep them away from wrong people but why don’t we care about our unclean surrounding which can cause diseases and equally devastate their future,” said Sheela.“It is in our hands to keep our surroundings clean and get everyone to use toilets,” said another lady. “We had no toilets till about five years ago. We realised its need and asked the Delhi Urban Shelter Improvement Board (DUSIB) to build one for us,” said Kumar. According to estimates by the Delhi Urban Shelter Improvement Board (DUSIB), there are only 79,000 toilets across 675 slums in the capital, home to over 15 lakh people. Enraged by the government’s attitude, Sheela and other women of the slum decided to revolt. As part of the Clean India Mission the government was already stressing on an ‘Open Defecation Free’ India by 2019. The women of the slum with all their efforts were successful in convincing the DUSIB to make the community toilets in their slums free-of-cost. The people of this slum seemed to have made a commitment to cleanliness and hygiene. No one could be seen littering or dumping waste anywhere in the open or streets. People like Sheela and parents like Kumar can make slums a better place for the people living there. With the combined efforts of the government and the slum dwellers, there is hope that each slum in India could transform itself.